R.J. ToomeyTM offers a complete line of vestments with a great value. Our popular classic jacquard dalmatic features the Fleur De Lis Cross in gold embroidery on front and back. It is crafted with careful attention to detail with reinforced backing as our Chasubles. 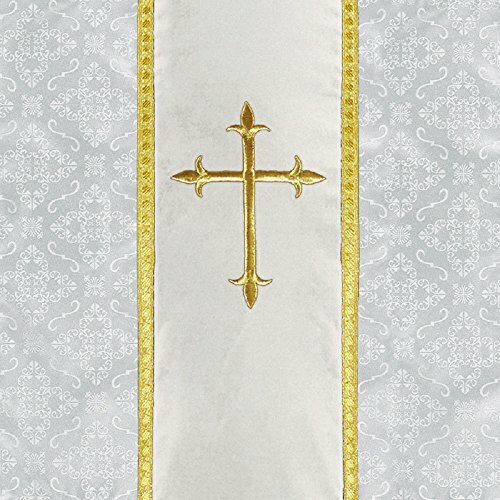 Color: White Material: Classic Jacquard - 200D*300D 62*29 235gsm, Velvet with gold embroider and gold lace Size: 59" x 48"
R.J. ToomeyTM offers a complete line of vestments with a great value. Our popular classic jacquard dalmatic features the Fleur De Lis Cross in gold embroidery on front and back. It is crafted with careful attention to detail with reinforced backing as our Chasubles.